These toys are extremely limited we only have 1 or 2 of the listed toys, please don't order larger quantities as we will have to substitute! 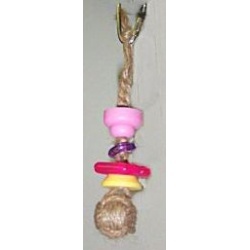 Jute monkey fist toy with moveable beads and baubles on stainless steel link. Plastic ball inside the fist. 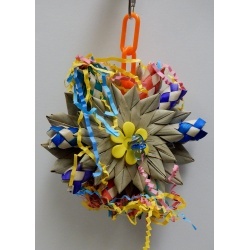 Palm flowers with playful tubes, plastic pacifiers and flower petals and shredding paper inside as a special surprise. All held together with a plastic chain. A hanging mini munch ball treat for your small birds. Mini much balls are inside bamboo chewing rounds, plus we have braided chewing strips, quarter inch colored wood balls with a pear link. Even a great bell for added fun. A toy for your busy chewing and shredding birdies!